BEAVER 1500 AUTO ROD CHANGER Model, Truck Mounted Hydraulically Operated Water Well Drilling Rig can capable of drilling from 6” to 8” Dia. Bore Holes in different formations such as hard rock by DTH method, Unconsolidated / alluvial formations using water / foam flush by Rotary method & Unconsolidated / Gravel / Boundary Formations using ODEX tools up to a depth of 450 Meters (1500 Ft.) under favorable Drilling Conditions. The hydraulic pumps shall be powered by the same truck engine through PTO. It is a two truck version drilling rig. 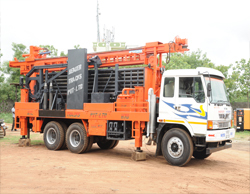 It is an advanced drilling rig for water well drilling. One Drilling Operator with two helpers can effectively operate the entire drilling operation. 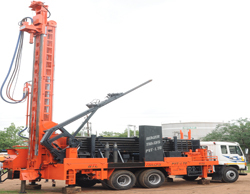 It is a fully automatic rod handling drilling rig. The main features of this concept are to reduce the Man Power and improve the efficiency of rod feeding and removal time in order to save the operational cost. The drilling operator can continue the drilling operation while this system prepares to position the next drill rod automatically, so the idle time of the machine is almost reduced. We can save atleast 40-50% of the operational and maintenance cost by this machine compare to normal drilling machine. No need of any technical person to operate. The normal drilling operator can operate effectively, so that it is more reliable and user friendly. Hydraulic oil tank capacity : 800 Ltrs. Airline Lubricator capacity : 15 Ltrs. Accessories / Optional attachments : Welding Alternator, Main Winch with jib and boom arrangement on the top of the mast.